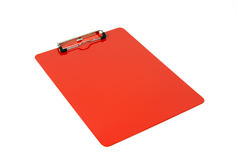 Long life aluminum clipboard with added beauty of powder coated protection. Protective powder coating adds credence to important work your organization accomplishes. Powder coated aluminum Clipboards. Menu restaurant. 12 x 9 inch size, low profile metalClip. We prefer powder coating technologies to painting on our aluminum clipboards. Electrostatic powder sprayed onto surface is oven baked. Superior appearance toughness and longevity, and powder�s minimal environmental impact in comparison to paint. 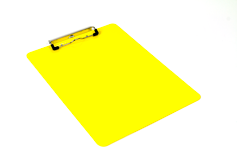 NO VOC, your Crane Binder aluminum clipboard does not contain any volatile organic compounds. Durable bright powder coated Blue clipboard, Brilliant Yellow aluminum Clipboards, Red aluminum clipboards. 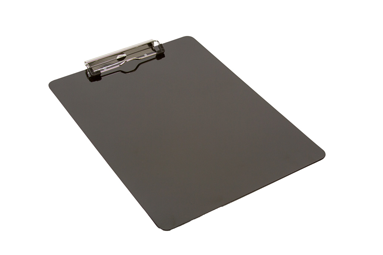 Surprised at increased popularity of Jet Black Aluminum clipboard. It is outselling the Blue, 1 inch. ©Copyright 1998-2019 Crane Binder Technologies - This site is protected by copyright and trademark laws under U.S. and International law. All rights reserved. Logos and trademarks used at this site are the respective property of their owners. They are shown merely for presentation purposes.